The TruDefinition® Duration® shingles embody what Owens Corning is all about. One of the most popular roofing brands in America, Owens Corning manufacture roofs that deliver an all-around performance. These shingles feature bold color blends and deep dimensions, lending a lot of character to any home. Using its trademark color design platform, Owens Corning optimizes designs these shingles with vibrant hues and dramatic shades, allowing multi-granule coloring and shadowing. The captivating aesthetic qualities of TruDefinition Duration shingles add architectural flair to your exterior and make your home harmonize with the natural world surrounding it. Thanks to Owens Corning’s patented SureNail® Technology, every Duration Series shingle is expected to stay in place no matter what happens. The tough-engineered woven fabric lies at the heart of this innovation’s breakthrough design. Embedded in the shingles, this prominent nailing strip creates a strong fastener zone. Furthermore, experienced roofing companies know that the SureNail strip complements the already incredible grip of Owens Corning’s proprietary Tru-Bond® sealant. When the fabric overlays two bottom layers of Duration shingles, it forms a common bond area and creates a durable “triple layer” reinforcement. As a result, Duration shingles can withstand wind speeds of up to 130 MPH. ENERGY STAR® approves the TruDefinition Duration shingles too. The series’s Shasta White color meets stringent energy efficiency requirements, sending the sun’s infrared rays back to the sky better than ordinary shingle hues. By absorbing far less heat and keep the attic cooler, especially during the hottest months, Duration shingles naturally last longer. The TruDefinition Duration Series is impervious to the unsightly algae too. If you normally experience muggy summers every year, these roofing shingles are guaranteed to inhibit algae growth for 10 years. In turn, you can preserve your home’s attracting curb appeal and make it a healthier place. 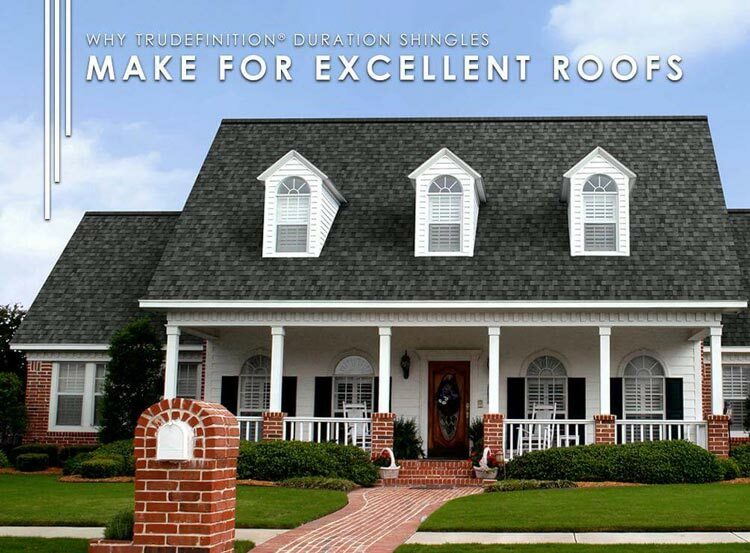 The TruDefinition Duration Shingle Series makes an excellent replacement roof in Michigan. To learn more about this product and discuss your roofing needs, call Kroll Construction now at (888) 338-6340. We’ll be happy to schedule your FREE, in-home consultation at your convenience.